This Sunday I had to switch off the television as I saw Republican Congressman Darrell Issa as a featured panel member on Meet The Press. This self proclaimed ex-car thief, arsonist and wielder of guns had an opinion that someone actually valued? David Gregory had on his panel of “experts” the man responsible for the all-male panel which grilled Sandra Fluke about contraception while failing to consult a single female expert? He’s done absolutely nothing to help create jobs and is launching a witch hunt to try to hold Eric Holder in contempt of Congress for withholding documents he is forbidden by law to release. It’s insane and I’m completely disgusted. Contrary to what many who know me might argue, I’m not crazy. 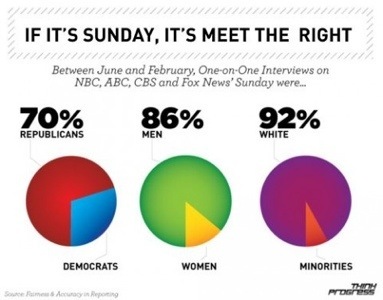 The Sunday talk show circuit is largely white, male AND Republican. Here’s a chart from Moveon.org. 9. Clear Channel Communications Inc.
I’ve heard of the CFR before, but had no idea of the scope of their influence. It’s quite a powerful conglomerate of people and multi-national corporations. The most insidious characteristic they have is their common goal of centralizing and merging everything into gigantic international mega-corporations. They are the proponents of a central banking system which Thomas Jefferson was firmly opposed to. “The Central Bank is an institution of the most deadly hostility existing against the principles and form of our Constitution…if the American people allow private banks to control the issuance of their currency, first by inflation and then by deflation, the banks and corporations that will grow up around them will deprive the people of all their property until their children will wake up homeless on the continent their fathers conquered.” Does that not describe the situation in America today? With the unmistakable power these corporations and their financiers wield, it seems his prediction has come to pass. 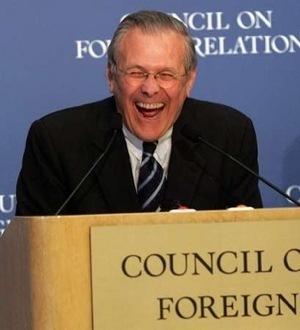 According to the aforementioned article, “Most influential politicians, academics and media personalities are members, and it uses its influence to infiltrate the New World Order into American life. Its’ “experts” write scholarly pieces to be used in decision making, the academics expound on the wisdom of a united world, and the media members disseminate the message”. Ah, so that’s it, a New World Order. The New World Order, is a term we first heard, coincidentally on September 11, 1990, by President George H.W. Bush. Really GOP? 9/11 again? With all these humongous mergers, it’s easy to see how easily we are manipulated by what’s deemed as newsworthy. We truly can’t control the media ourselves. It’s definitely NOT LIBERAL. Why do you think Joe Scarborough gets three full hours every day on Morning Joe on MSNBC? Perhaps because the MS in MSNBC stands for Microsoft, Bill Gate’s Microsoft donated 2.4 million in 2000 to get George W Bush elected. Et tu Bill Gates? We are totally screwed. I’m going to watch cartoons. Next Post Why is Willard Running Away from the REAL ROMNEY? I’m flattered you read my ramblings. I hope I don’t frighten you with my radical views. Thanks! I just saw your article go by me on Twitter – wow! Way to dig into the meat of the matter and find out who’s behind that. Very interesting – thanks. A very well researched and thought out post. My only concern would be the 70%-30% Rep -Dem split. It’s much worse than that because some of those Dems are blue-dog turn coats. The Blue Dogs need to do the right thing. No one wants to limit hunting.